This project was created on 04/06/2017 and last updated 2 months ago. This is a part of a smart Robot control system(AnanasRobot), based on Stepper Motor and CAN bus.This project aims to build a motion control system including hardware and software to make Multi-Axis Gang Control easy and precise, applied to 3D printer, a 6+ axis robot arm or some more complex motion control system. Main Features: 1.CAN bus based(up to 1 Mbit). 2.STM32 32bit ARM MCU(Cortex-M3 72MHz). 3.Closed loop control with 14bit magnetic encoders(TLE5012). 5.Extendable(For more than 12+ motors), and Easy for Installation(With two twisted wires and power to get the whole system available). 6.USB-CAN Adapter and SPI-CAN Adapter For systems without CAN bus. This an upgrade of AnanasStepper(https://github.com/Dark-Guan/Ananas), which is a stand alone closed loop stepper driver.With STM32 MCU, this version has more performance to driver stepper well and CAN Bus support. All the wiring I need is 12V and a twisted pair for CAN to link All device all together. So the main module can control all of them and monitor the state(position temprature or current) of them. I use 2 AnanasStepper to build a 2D plotter, Test 2D Axis Gang Control. I tested AnanasStepper to Play MIDI music,And used My guitar as a loud-speaker! It is not very nice but it works!! New Kits! New Kits With More PowerFul Driver! CAN RS485 Step/Dir Supports! New Features And Now PCB​ For Kickstarter! After huge work for test and planning, Ours New Pro Product is prepared for Kickstarter ! If there is no bug? If there is no bug?What will happen? a.Assemble the 3D printed spacer. c, Final assemble the Nuts. Connect them follow the arrows. When Will the stm32 software been shared? Yes, And we are planing a Pro verison for kickstarter!! Thank you for your attention. I realy like this project. Wille you make stm32 sources available to public? Thanks for your suggest. 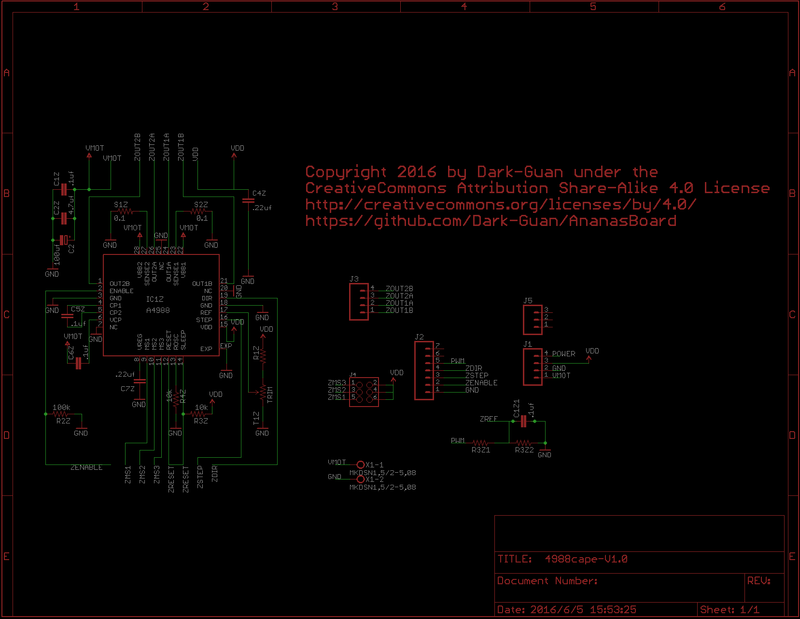 Yes I plan to use a dual MOSFETs in SOP8 package and IR210x mos driver to build a drive for This project. And I should do some more Test. Your project is awesome, I like them. Cool! What is the maximum motor voltage that you&apos;re planning on supporting? I&apos;d like set the maximum to 24V , which affects component selection. About this part, What&apos;s your suggestion? Well, higher voltage will get you higher motor speeds. The FETs start to become kinda expensive and less available beyond 80V, and I feel the IR210x gate drivers will be sort of wasted at 24V (they can go up to 600V), so maybe you can go with a commonplace 48V system. But if you choose 24V, The DRV8701 (the one I&apos;m using) its a good candidate, as it includes an internal 12V supply for the FET gates (the IR210x doesn&apos;t). Thanks very much , I will consider your suggestions. How many amps can this board handle? Thanks! Actually, I read the CANOpen protocol and consulted some engineers familiar with it. And I figure out it is so complex. So I write another protocol for my system . My goal is simple and efficient , with some reasonable expansibility. Okay fair enough. What about using stuff already written, like https://github.com/CANopenNode/CANopenNode and http://wiki.ros.org/canopen_402 ? But, if it is necessary , I want to support it though it means I should do a lot of change with my system. I am not familiar with http://wiki.ros.org/canopen_402 now. But I have the plan to support ROS. I will try it later. Nice thing. I just searched for some info to build something like this by my self. I only do not understand the CAN bus decision. I like the CAN bus and its features, but how do you plan to connect it to a grbl or similar? Or is the ananas 2.0 no meant to be used for hobby CNCs / 3d printers? Thanks very much!There are several way to connect AnanasSteppers 2.0 to normal CNC system , Serial to CAN or SPI to CAN (They are very cheap ,no more then 10 dollars).Ananas 1.0 is a version that support DIR/STEP and I2C interface . I am foucing on AnanasStepper 2.0 Now ,After Releasing Python API , A C/C++ API is on the way. So if I understand you correctly, grbl / marlin will need a CAM interface to be used, right? If thats the case I would like to help, do you already have some informations about the protocol at the CAM bus? You are right! I am test the protocol Today. The demo test will be released Soon!! Thanks for your hope to help! I will remind you soon! Would you like to share the fritizing files of the old ananans stepper? Oh, I am so sorry ,Today I check my github ,there is no fritizing file. I think I lost them. 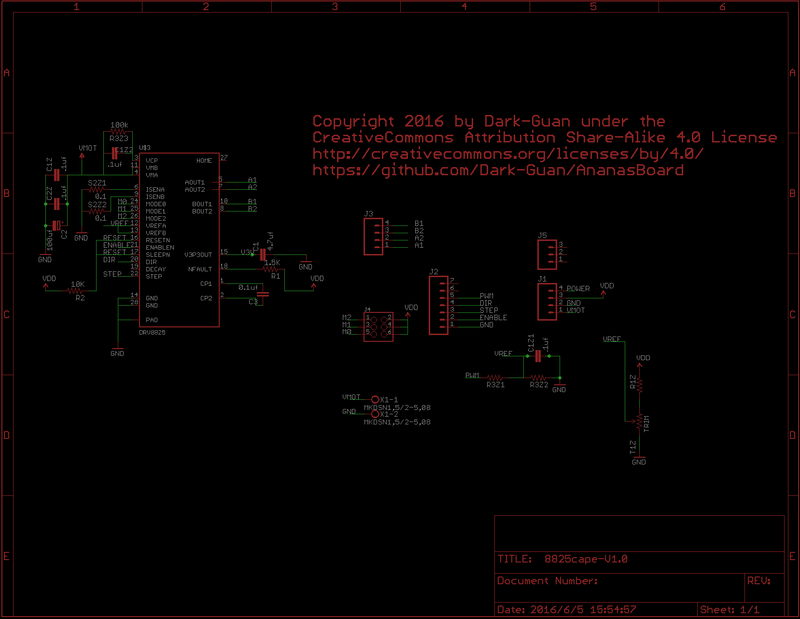 Don&apos;t warry ,the more detail is here https://github.com/Dark-Guan/AnanasBoard , which is used Eagle . Hope this help you! You are about to report the project "AnanasStepper 2.0", please tell us the reason.